When will be Vanderpump Rules: Jax & Brittany Take Kentucky next episode air date? Is Vanderpump Rules: Jax & Brittany Take Kentucky renewed or cancelled? Where to countdown Vanderpump Rules: Jax & Brittany Take Kentucky air dates? Is Vanderpump Rules: Jax & Brittany Take Kentucky worth watching? Vanderpump Rules: Jax & Brittany Take Kentucky follows bad-boy bartender Jax Taylor and his southern belle girlfriend Brittany Cartwright as they head on vacation, leaving the comfortable confines of Los Angeles to visit her family on their Kentucky farm. Ditching his signature chunky sweater for overalls, city-boy Jax is the ultimate fish out of water as he tries to embrace the southern lifestyle and make a lasting impression on her family and friends. Brittany's best friend confronts Jax for belittling Brittany; Brittany's brother and sister-in-law throw a fundraiser to have a baby via in vitro fertilization, but Jax's plan to be a hero backfires; Jax's claims about Brittany causes skepticism. Jax goes to a church service in an effort to please Brittany's family; Brittany is shocked to learn Jax has made claims that she's depressed; Don takes Jax on a coyote-hunting excursion; Brittany's ex-boyfriend shows up at a local bar. Brittany fights with Jax over his drunken exploits; Jax and Brittany take an ATV ride in the woods; Brittany shares a campfire with her father who reveals he does not fully support her relationship with Jax. Jax and Brittany share a farewell dinner with Brittany's family and friends; Don questions Jax's intentions; Jax and Brittany have an explosive argument before departing for Los Angeles, and Brittany must decide whether to stay in Kentucky. 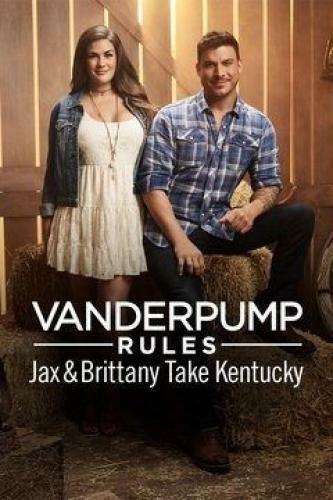 Vanderpump Rules: Jax & Brittany Take Kentucky next episode air date provides TVMaze for you. EpisoDate.com is your TV show guide to Countdown Vanderpump Rules: Jax & Brittany Take Kentucky Episode Air Dates and to stay in touch with Vanderpump Rules: Jax & Brittany Take Kentucky next episode Air Date and your others favorite TV Shows. Add the shows you like to a "Watchlist" and let the site take it from there.